Google Inc. is an American multinational public corporation invested in Internet search, cloud computing, and advertising technologies. Google hosts and develops a number of Internet-based services and products, and generates profit primarily from advertising through its AdWords program. The company was founded by Larry Page and Sergey Brin, often dubbed the "Google Guys", while the two were attending Stanford University as PhD candidates. It was first incorporated as a privately held company on September 4, 1998, and its initial public offering followed on August 19, 2004. At that time Larry Page, Sergey Brin, and Eric Schmidt agreed to work together at Google for twenty years, until the year 2024. The company's mission statement from the outset was "to organize the world's information and make it universally accessible and useful", and the company's unofficial slogan – coined by Google engineer Paul Buchheit – is "Don't be evil". In 2006, the company moved to its current headquarters in Mountain View, California. Google runs over one million servers in data centers around the world, and processes over one billion search requests and about twenty-four petabytes of user-generated data every day. Google's rapid growth since its incorporation has triggered a chain of products, acquisitions, and partnerships beyond the company's core web search engine. The company offers online productivity software, such as its Gmail email service, and social networking tools, including Orkut and, more recently, Google Buzz. Google's products extend to the desktop as well, with applications such as the web browser Google Chrome, the Picasa photo organization and editing software, and the Google Talk instant messaging application. Notably, Google leads the development of the Android mobile operating system, used on a number of phones such as the Nexus One and Motorola Droid, as well as Google Chrome OS, which is still under heavy development but is best known as the main operating system on the Cr-48. Alexa lists the main U.S.-focused google.com site as the Internet's most visited website, and numerous international Google sites (google.co.in, google.co.uk etc.) are in the top hundred, as are several other Google-owned sites such as YouTube, Blogger, and Orkut. Google also ranks number one in the BrandZ brand equity database. The dominant market position of Google's services has led to criticism of the company over issues including privacy, copyright, and censorship. Google's original homepage had a simple design since its founders were not experienced in HTML, the language for designing web pages. Eventually, they changed the name to Google, originating from a misspelling of the word "googol", the number one followed by one hundred zeros, which was picked to signify that the search engine wants to provide large quantities of information for people. Originally, Google ran under the Stanford University website, with the domain google.stanford.edu. The domain name for Google was registered on September 15, 1997, and the company was incorporated on September 4, 1998. It was based in a friend's (Susan Wojcicki) garage in Menlo Park, California. Craig Silverstein, a fellow PhD student at Stanford, was hired as the first employee. During this time, Google was granted a patent describing its PageRank mechanism. The patent was officially assigned to Stanford University and lists Lawrence Page as the inventor. In 2003, after outgrowing two other locations, the company leased its current office complex from Silicon Graphics at 1600 Amphitheatre Parkway in Mountain View, California. The complex has since come to be known as the Googleplex, a play on the word googolplex, the number one followed by a googol zeroes. Three years later, Google would buy the property from SGI for $319 million. By that time, the name "Google" had found its way into everyday language, causing the verb "google" to be added to the Merriam Webster Collegiate Dictionary and the Oxford English Dictionary, denoted as "to use the Google search engine to obtain information on the Internet." Since 2001, Google has acquired many companies, mainly focusing on small venture capital companies. In 2004, Google acquired Keyhole, Inc. The start-up company developed a product called Earth Viewer that gave a 3-D view of the Earth. Google renamed the service to Google Earth in 2005. Two years later, Google bought the online video site YouTube for $1.65 billion in stock. On April 13, 2007, Google reached an agreement to acquire DoubleClick for $3.1 billion, giving Google valuable relationships that DoubleClick had with Web publishers and advertising agencies. Later that same year, Google purchased GrandCentral for $50 million. The site would later be changed over to Google Voice. On August 5, 2009, Google bought out its first public company, purchasing video software maker On2 Technologies for $106.5 million. Google also acquired Aardvark, a social network search engine, for $50 million, and commented on their internal blog, "we're looking forward to collaborating to see where we can take it". In April 2010, Google announced it had acquired a hardware startup, Agnilux. In addition to the numerous companies Google has purchased, the company has partnered with other organizations for everything from research to advertising. In 2005, Google partnered with NASA Ames Research Center to build 1,000,000 square feet (93,000 m2) of offices. The offices would be used for research projects involving large-scale data management, nanotechnology, distributed computing, and the entrepreneurial space industry. Later that year, Google entered into a partnership with Sun Microsystems in October 2005 to help share and distribute each other's technologies. The company also partnered with AOL of Time Warner, to enhance each other's video search services. Google's 2005 partnerships also included financing the new .mobi top-level domain for mobile devices, along with other companies including Microsoft, Nokia, and Ericsson. Google would later launch "Adsense for Mobile", taking advantage of the emerging mobile advertising market. Increasing their advertising reach even further, Google and Fox Interactive Media of News Corporation entered into a $900 million agreement to provide search and advertising on popular social networking site MySpace. In October 2006, Google announced that it had acquired the video-sharing site YouTube for US$1.65 billion in Google stock, and the deal was finalized on November 13, 2006. Google does not provide detailed figures for YouTube's running costs, and YouTube's revenues in 2007 were noted as "not material" in a regulatory filing. In June 2008, a Forbes magazine article projected the 2008 YouTube revenue at US$200 million, noting progress in advertising sales. In 2007, Google began sponsoring NORAD Tracks Santa, a service that pretends to follow Santa Claus' progress on Christmas Eve, using Google Earth to "track Santa" in 3-D for the first time, and displacing former sponsor AOL. Google-owned YouTube gave NORAD Tracks Santa its own channel. In 2008, Google developed a partnership with GeoEye to launch a satellite providing Google with high-resolution (0.41 m monochrome, 1.65 m color) imagery for Google Earth. The satellite was launched from Vandenberg Air Force Base on September 6, 2008. Google also announced in 2008 that it was hosting an archive of Life Magazine's photographs as part of its latest partnership. Some of the images in the archive were never published in the magazine. The photos were watermarked and originally had copyright notices posted on all photos, regardless of public domain status. On April 4, 2011 The Globe and Mail reported that Google bid $900-million for six thousand Nortel Networks patents. One of the disadvantages and criticisms of this program is Google's inability to combat click fraud, when a person or automated script "clicks" on advertisements without being interested in the product, which causes that advertiser to pay money to Google unduly. Industry reports in 2006 claim that approximately 14 to 20 percent of clicks were in fact fraudulent or invalid. Furthermore, there has been controversy over Google's "search within a search", where a secondary search box enables the user to find what they are looking for within a particular website. It was soon reported that when performing a search within a search for a specific company, advertisements from competing and rival companies often showed up along with those results, drawing users away from the site they were originally searching. Another complaint against Google's advertising is their censorship of advertisers, though many cases concern compliance with the Digital Millennium Copyright Act. For example, in February 2003, Google stopped showing the advertisements of Oceana, a non-profit organization protesting a major cruise ship's sewage treatment practices. Google cited its editorial policy at the time, stating "Google does not accept advertising if the ad or site advocates against other individuals, groups, or organizations." The policy was later changed. In June 2008, Google reached an advertising agreement with Yahoo!, which would have allowed Yahoo! to feature Google advertisements on their web pages. The alliance between the two companies was never completely realized due to antitrust concerns by the U.S. Department of Justice. As a result, Google pulled out of the deal in November 2008. Google Search, a web search engine, is the company's most popular service. According to market research published by comScore in November 2009, Google is the dominant search engine in the United States market, with a market share of 65.6%. Google indexes billions of web pages, so that users can search for the information they desire, through the use of keywords and operators. Despite its popularity, it has received criticism from a number of organizations. In 2003, The New York Times complained about Google's indexing, claiming that Google's caching of content on their site infringed on their copyright for the content. In this case, the United States District Court of Nevada ruled in favor of Google in Field v. Google and Parker v. Google. Furthermore, the publication 2600: The Hacker Quarterly has compiled a list of words that the web giant's new instant search feature will not search. Google Watch has also criticized Google's PageRank algorithms, saying that they discriminate against new websites and favor established sites, and has made allegations about connections between Google and the NSA and the CIA. Despite criticism, the basic search engine has spread to specific services as well, including an image search engine, the Google News search site, Google Maps, and more. In early 2006, the company launched Google Video, which allowed users to upload, search, and watch videos from the Internet. In 2009, however, uploads to Google Video were discontinued so that Google could focus more on the search aspect of the service. The company even developed Google Desktop, a desktop search application used to search for files local to one's computer. Google's most recent development in search is their partnership with the United States Patent and Trademark Office to create Google Patents, which enables free access to information about patents and trademarks. One of the more controversial search services Google hosts is Google Books. The company began scanning books and uploading limited previews, and full books where allowed, into their new book search engine. The Authors Guild, a group that represents 8,000 U.S. authors, filed a class action suit in a New York City federal court against Google in 2005 over this new service. Google replied that it is in compliance with all existing and historical applications of copyright laws regarding books. Google eventually reached a revised settlement in 2009 to limit its scans to books from the U.S., the UK, Australia and Canada. Furthermore, the Paris Civil Court ruled against Google in late 2009, asking them to remove the works of La Martinière (Éditions du Seuil) from their database. In competition with Amazon.com, Google plans to sell digital versions of new books. Similarly, in response to newcomer Bing, on July 21, 2010, Google updated their image search to display a streaming sequence of thumbnails that enlarge when pointed at. Though web searches still appear in a batch per page format, on July 23, 2010, dictionary definitions for certain English words began appearing above the linked results for web searches. Google's algorithm was changed in March 2011, giving more weight to high-quality content possibly by the use of n-grams to remove spun content. Google Translate is a server-side machine translation service, which can translate between 35 different languages. Browser extensions allow for easy access to Google Translate from the browser. The software uses corpus linguistics techniques, where the program "learns" from professionally translated documents, specifically UN and European Parliament proceedings. Furthermore, a "suggest a better translation" feature accompanies the translated text, allowing users to indicate where the current translation is incorrect or otherwise inferior to another translation. In 2006, Google made a bid to offer free wireless broadband access throughout the city of San Francisco along with Internet service provider EarthLink. Large telecommunications companies such as Comcast and Verizon opposed such efforts, claiming it was "unfair competition" and that cities would be violating their commitments to offer local monopolies to these companies. In his testimony before Congress on network neutrality in 2006, Google's Chief Internet Evangelist Vint Cerf blamed such tactics on the fact that nearly half of all consumers lack meaningful choice in broadband providers. Google currently offers free wi-fi access in its hometown of Mountain View, California. Other projects Google has worked on include a new collaborative communication service, a web browser, and even a mobile operating system. The first of these was first announced on May 27, 2009. Google Wave was described as a product that helps users communicate and collaborate on the web. The service is Google's "email redesigned", with realtime editing, the ability to embed audio, video, and other media, and extensions that further enhance the communication experience. Google Wave was previously in a developer's preview, where interested users had to be invited to test the service, but was released to the general public on May 19, 2010, at Google's I/O keynote. On September 1, 2008, Google pre-announced the upcoming availability of Google Chrome, an open source web browser, which was then released on September 2, 2008. The next year, on July 7, 2009, Google announced Google Chrome OS, an open source Linux-based operating system that includes only a web browser and is designed to log users into their Google account. 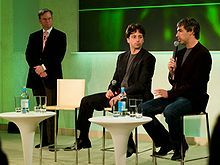 Then-CEO, now Chairman of Google Eric Schmidt with Sergey Brin and Larry Page (left to right) in 2008. Google's stock performance following its initial public offering has enabled many early employees to be competitively compensated. After the company's IPO, founders Sergey Brin and Larry Page and CEO Eric Schmidt requested that their base salary be cut to $1. Subsequent offers by the company to increase their salaries have been turned down, primarily because their main compensation continues to come from owning stock in Google. Before 2004, Schmidt was making $250,000 per year, and Page and Brin each earned a salary of $150,000. In 2007 and through early 2008, several top executives left Google. In October 2007, former chief financial officer of YouTube Gideon Yu joined Facebook along with Benjamin Ling, a high-ranking engineer. In March 2008, Sheryl Sandburg, then vice-president of global online sales and operations, began her position as chief operating officer of Facebook while Ash ElDifrawi, formerly head of brand advertising, left to become chief marketing officer of Netshops, an online retail company that was renamed Hayneedle in 2009. On April 4, 2011 Larry Page became CEO and Eric Schmidt became Executive Chairman of Google. On March 2011, consulting firm Universum released data that Google ranks the first on list of ideal employers by nearly 25 percent chosen from more than 10,000 young professionals asked. It means almost twice as many as choose the second rank. Google's headquarters in Mountain View, California is referred to as "the Googleplex", a play on words on the number googolplex and the headquarters itself being a complex of buildings. The lobby is decorated with a piano, lava lamps, old server clusters, and a projection of search queries on the wall. The hallways are full of exercise balls and bicycles. Each employee has access to the corporate recreation center. Recreational amenities are scattered throughout the campus and include a workout room with weights and rowing machines, locker rooms, washers and dryers, a massage room, assorted video games, table football, a baby grand piano, a billiard table, and ping pong. In addition to the rec room, there are snack rooms stocked with various foods and drinks. In 2006, Google moved into 311,000 square feet (28,900 m2) of office space in New York City, at 111 Eighth Avenue in Manhattan. The office was specially designed and built for Google, and it now houses its largest advertising sales team, which has been instrumental in securing large partnerships. In 2003, they added an engineering staff in New York City, which has been responsible for more than 100 engineering projects, including Google Maps, Google Spreadsheets, and others. It is estimated that the building costs Google $10 million per year to rent and is similar in design and functionality to its Mountain View headquarters, including table football, air hockey, and ping-pong tables, as well as a video game area. In November 2006, Google opened offices on Carnegie Mellon's campus in Pittsburgh, focusing on shopping related advertisement coding and smartphone applications and programs. By late 2006, Google also established a new headquarters for its AdWords division in Ann Arbor, Michigan. Furthermore, Google has offices all around the world, and in the United States, including Atlanta, Austin, Boulder, San Francisco, Seattle, and Washington DC. Google is taking steps to ensure that their operations are environmentally sound. In October 2006, the company announced plans to install thousands of solar panels to provide up to 1.6 megawatts of electricity, enough to satisfy approximately 30% of the campus' energy needs. The system will be the largest solar power system constructed on a U.S. corporate campus and one of the largest on any corporate site in the world. In addition, Google announced in 2009 that it was deploying herds of goats to keep grassland around the Googleplex short, helping to prevent the threat from seasonal bush fires while also reducing the carbon footprint of mowing the extensive grounds. The idea of trimming lawns using goats originated from R. J. Widlar, an engineer who worked for National Semiconductor. Despite this, Google has faced accusations in Harper's Magazine of being extremely excessive with their energy usage, and were accused of employing their "Don't be evil" motto as well as their very public energy saving campaigns as means of trying to cover up or make up for the massive amounts of energy their servers actually require. Google has a tradition of creating April Fools' Day jokes. For example, Google MentalPlex allegedly featured the use of mental power to search the web. In 2007, Google announced a free Internet service called TiSP, or Toilet Internet Service Provider, where one obtained a connection by flushing one end of a fiber-optic cable down their toilet. Also in 2007, Google's Gmail page displayed an announcement for Gmail Paper, allowing users to have email messages printed and shipped to them. In 2008 Google announced Gmail Custom time where users could change the time that the email was sent. In 2010, Google jokingly changed its company name to Topeka in honor of Topeka, Kansas, whose mayor actually changed the city's name to Google for a short amount of time in an attempt to sway Google's decision in its new Google Fiber Project. In 2011, Google announced Gmail Motion, an interactive way of controlling Gmail and the computer with body movements via the user's webcam. In addition to April Fools' Day jokes, Google's services contain a number of Easter eggs. For instance, Google included the Swedish Chef's "Bork bork bork," Pig Latin, "Hacker" or leetspeak, Elmer Fudd, and Klingon as language selections for its search engine. In addition, the search engine calculator provides the Answer to the Ultimate Question of Life, the Universe, and Everything from Douglas Adams' The Hitchhiker's Guide to the Galaxy. Furthermore, when searching the word "recursion", the spell-checker's result for the properly spelled word is exactly the same word, creating a recursive link. Likewise, when searching for the word "anagram," meaning a rearrangement of letters from one word to form other valid words, Google's suggestion feature displays "Did you mean: nag a ram?" In Google Maps, searching for directions between places separated by large bodies of water, such as Los Angeles and Tokyo, results in instructions to "kayak across the Pacific Ocean." During FIFA World Cup 2010, search queries like "World Cup", "FIFA", etc. caused the "Goooo...gle" page indicator at the bottom of every result page to read "Goooo...al!" instead. In 2011, Google donated 1 million euros to International Mathematical Olympiad for to support the next five annual International Mathematical Olympiads (2011–2015). Despite being highly influential in local and national public policy, Google does not disclose its political spending online. In August 2010, New York City Public Advocate Bill de Blasio launched a national campaign urging the corporation to disclose all of its political spending. ^ a b c d e f g "Google Milestones". Corporate Information. Google, Inc.. http://www.google.com/intl/en/corporate/history.html. Retrieved September 28, 2010. ^ Third Amended and Restated Certificate of Incorporation of Google Inc. (Delaware). August 24, 2004. http://investor.google.com/corporate/certificate-of-incorporation.html. Retrieved September 27, 2008. ^ a b c d e f U.S. Securities and Exchange Commission (2010). "Form 10-K". Washington, D.C.: United States of America. Part II, Item 6. http://www.sec.gov/Archives/edgar/data/1288776/000119312511032930/d10k.htm. Retrieved March 4, 2011. ^ See: List of Google products. ^ "Financial Tables". Google, Inc.. http://investor.google.com/fin_data.html. Retrieved July 5, 2010. ^ Vise, David A. (October 21, 2005). "Online Ads Give Google Huge Gain in Profit". The Washington Post. ^ Ignatius, Adi (February 12, 2006). "Meet the Google Guys". Time Magazine (San Francisco, CA: Time Inc.). http://www.time.com/time/magazine/article/0,9171,1158956,00.html. Retrieved March 27, 2010. ^ "The Google Guys". CBS News.com (CBS Interactive). March 12, 2009. http://www.cbsnews.com/video/watch/?id=4835250n&tag=mncol;lst;1. Retrieved March 27, 2010. ^ Barrett, Brian (February 4, 2010). "Google Wants to Add Store Interiors to Maps". Gizmodo. http://gizmodo.com/5464532/google-wants-to-add-store-interiors-to-maps. Retrieved March 27, 2010. ^ Lashinsky, Adam (January 29, 2008). "Google wins again". Fortune.com (Time Warner). http://money.cnn.com/2008/01/18/news/companies/google.fortune/index.htm. Retrieved January 22, 2011. ^ "Google Corporate Information". Google, Inc.. http://www.google.com/corporate/. Retrieved February 14, 2010. ^ "Google Code of Conduct". Google, Inc.. April 8, 2009. http://investor.google.com/conduct.html. Retrieved July 5, 2010. ^ Lenssen, Philip (July 16, 2007). "Paul Buchheit on Gmail, AdSense and More". Google Blogscoped. http://blogoscoped.com/archive/2007-07-16-n55.html. Retrieved February 14, 2010. ^ "Pandia Search Engine News — Google: one million servers and counting". Pandia Search Engine News. July 2, 2007. http://www.pandia.com/sew/481-gartner.html. Retrieved February 14, 2010. ^ Kuhn, Eric (December 18, 2009). "CNN Politics — Political Ticker... Google unveils top political searches of 2009". CNN. http://politicalticker.blogs.cnn.com/2009/12/18/google-unveils-top-political-searches-of-2009/. Retrieved February 14, 2010. ^ "MapReduce". Portal.acm.org. http://portal.acm.org/citation.cfm?doid=1327452.1327492. Retrieved August 16, 2009. ^ Czajkowski, Grzegorz (November 21, 2008). "Sorting 1PB with MapReduce". Official Google Blog. Google, Inc.. http://googleblog.blogspot.com/2008/11/sorting-1pb-with-mapreduce.html. Retrieved July 5, 2010. ^ Kennedy, Niall (January 8, 2008). "Google processes over 20 petabytes of data per day". Niall Kennedy's Weblog. Niall Kennedy. http://www.niallkennedy.com/blog/2008/01/google-mapreduce-stats.html. Retrieved July 5, 2010. ^ Schonfeld, Erick (January 9, 2008). "Google Processing 20,000 Terabytes A Day, And Growing". TechCrunch. TechCrunch. http://techcrunch.com/2008/01/09/google-processing-20000-terabytes-a-day-and-growing/. Retrieved February 16, 2010. ^ "Alexa Traffic Rank for Google (three month average)". Alexa Internet. http://www.alexa.com/siteinfo/google.com. Retrieved September 6, 2009. ^ "Top 100 Most Powerful Brands of 2009" (PDF). BrandZ. 2008. p. 9. http://c1547732.cdn.cloudfiles.rackspacecloud.com/BrandZ_Top100_2010.pdf. Retrieved February 14, 2010. ^ "Google ranked 'worst' on privacy". BBC News. June 11, 2007. http://news.bbc.co.uk/2/hi/technology/6740075.stm. Retrieved April 30, 2010. ^ Rosen, Jeffrey (November 30, 2008). "Google’s Gatekeepers". New York Times. http://www.nytimes.com/2008/11/30/magazine/30google-t.html?_r=1&partner=rss&emc=rss&pagewanted=all. Retrieved July 5, 2010. ^ Williamson, Alan (January 12, 2005). "An evening with Google's Marissa Mayer". Alan Williamson. http://alan.blog-city.com/an_evening_with_googles_marissa_mayer.htm. Retrieved July 5, 2010. ^ Page, Lawrence; Brin, Sergey; Motwani, Rajeev; Winograd, Terry (November 11, 1999). "The PageRank Citation Ranking: Bringing Order to the Web". Stanford University. http://ilpubs.stanford.edu:8090/422/. Retrieved February 15, 2010. ^ "Technology Overview". Corporate Information. Google, Inc.. http://www.google.com/corporate/tech.html. Retrieved February 15, 2010. ^ Page, Larry (August 18, 1997). "PageRank: Bringing Order to the Web". Stanford Digital Library Project. Archived from [www-diglib.stanford.edu/cgi-bin/WP/get/SIDL-WP-1997-0072?1 the original] on May 6, 2002. http://web.archive.org/web/20020506051802/www-diglib.stanford.edu/cgi-bin/WP/get/SIDL-WP-1997-0072?1. Retrieved November 27, 2010. ^ Li, Yanhong (August 6, 2002). "Toward a qualitative search engine". Internet Computing, IEEE (IEEE Computer Society) 2 (4): 24–29. doi:10.1109/4236.707687. ISSN 1089-7801. http://ieeexplore.ieee.org/search/freesrchabstract.jsp?tp=&arnumber=707687. Retrieved February 14, 2010. ^ US patent 5920859, Li, Yanhong, "Hypertext document retrieval system and method", issued July 6, 1999, assigned to IDD Enterprises, L.P.
^ Greenberg, Andy (October 5, 2009). "The Man Who's Beating Google". Forbes Magazine. http://www.forbes.com/forbes/2009/1005/technology-baidu-robin-li-man-whos-beating-google_2.html. Retrieved October 12, 2010. ^ "About: RankDex". RankDex.com. http://www.rankdex.com/about.html. Retrieved October 12, 2010. ^ Battelle, John (August 2005). "The Birth of Google". Wired Magazine. http://www.wired.com/wired/archive/13.08/battelle.html?tw=wn_tophead_4. Retrieved October 12, 2010. ^ "9 People, Places & Things That Changed Their Names". Mental Floss. http://blogs.static.mentalfloss.com/blogs/archives/22707.html. Retrieved December 20, 2009. ^ "Backrub search engine at Stanford University". Archived from the original on December 24, 1996. http://replay.waybackmachine.org/19961224105215/http://huron.stanford.edu/. Retrieved March 12, 2011. ^ Koller, David (January 2004). "Origin of the name "Google"". Stanford University. http://graphics.stanford.edu/~dk/google_name_origin.html. Retrieved February 15, 2010. ^ Hanley, Rachael (February 12, 2003). "From Googol to Google". The Stanford Daily (Stanford University). http://www.stanforddaily.com/2003/02/12/from-googol-to-google/. Retrieved February 15, 2010. ^ "Google! Beta website". Google, Inc.. Archived from the original on February 2, 1999. http://web.archive.org/web/19990221202430/www.google.com/company.html. Retrieved October 12, 2010. ^ "Google! Search Engine". Stanford University. Archived from the original on November 11, 1998. http://web.archive.org/web/19981111183552/http://google.stanford.edu/. Retrieved October 12, 2010. ^ "WHOIS — google.com". http://whois.dnsstuff.com/tools/whois.ch?ip=google.com. Retrieved July 5, 2010. ^ "Craig Silverstein's website". Stanford University. Archived from the original on October 2, 1999. http://web.archive.org/web/19991002122809/www-cs-students.stanford.edu/~csilvers/. Retrieved October 12, 2010. ^ Kopytoff, Verne (September 7, 2008). "Craig Silverstein grew a decade with Google". San Francisco Chronicle (Hearst Communications, Inc.). http://articles.sfgate.com/2008-09-07/news/17161124_1_larry-page-google-search-engine. Retrieved October 12, 2010. ^ "Google Server Assembly". Computer History Museum. http://www.computerhistory.org/collections/accession/102662167. Retrieved July 4, 2010. ^ a b Kopytoff, Verne (April 29, 2004). "For early Googlers, key word is $$$". San Francisco Chronicle (San Francisco: Hearst Communications). http://www.sfgate.com/cgi-bin/article.cgi?file=/chronicle/archive/2004/04/29/MNGLD6CFND34.DTL. Retrieved February 19, 2010. ^ Google (June 7, 1999). "Google Receives $25 Million in Equity Funding". Press release. Archived from the original on March 9, 2000. http://www.google.com/press/pressrel/pressrelease1.html. Retrieved February 16, 2009. ^ Elgin, Ben (August 19, 2004). "Google: Whiz Kids or Naughty Boys?". BusinessWeek (Bloomberg, L.P.). http://www.businessweek.com/technology/content/aug2004/tc20040819_6843_tc120.htm. Retrieved February 19, 2010. ^ "2004 Annual Report". Mountain View, California: Google, Inc.. 2004. p. 29. http://investor.google.com/pdf/2004_AnnualReport.pdf. Retrieved February 19, 2010. ^ La Monica, Paul R. (April 30, 2004). "Google sets $2.7 billion IPO". CNN Money. http://money.cnn.com/2004/04/29/technology/google/. Retrieved February 19, 2010. ^ Kawamoto, Dawn (April 29, 2004). "Want In on Google's IPO?". ZDNet. CBS Interactive. http://www.zdnet.com/news/want-in-on-googles-ipo/135799. Retrieved February 19, 2010. ^ Webb, Cynthia L. (August 19, 2004). "Google's IPO: Grate Expectations". Washington Post (Washington, D.C.: The Washington Post Company). http://www.washingtonpost.com/wp-dyn/articles/A14939-2004Aug19.html. Retrieved February 19, 2010. ^ Kuchinskas, Susan (August 9, 2004). "Yahoo and Google Settle". internet.com (QuinStreet, Inc.). http://www.internetnews.com/bus-news/article.php/3392781. Retrieved February 19, 2010. ^ "Quirky Google Culture Endangered?". Wired Magazine. Associated Press. April 28, 2004. http://www.wired.com/techbiz/media/news/2004/04/63241. Retrieved November 27, 2010. ^ Olsen, Stefanie; Kawamoto, Dawn (April 30, 2004). "Google IPO at $2.7 billion". CNET News. CBS Interactive. http://news.cnet.com/2100-1024-5201978.html. Retrieved November 27, 2010. ^ Rivlin, Gary (August 24, 2005). New York Times. http://www.nytimes.com/2005/08/24/technology/24valley.html. Retrieved November 27, 2010. ^ Gibson, Owen; Wray, Richard (August 25, 2005). "Search giant may outgrow its fans". The Sydney Morning Herald. http://www.smh.com.au/news/technology/search-giant-may-outgrow-its-fans/2005/08/25/1124562975596.html3001.asp. Retrieved November 27, 2010. ^ Ranka, Mohit (May 17, 2007). "Google — Don't Be Evil". OSNews. http://www.osnews.com/story/17928/Google--Dont-Be-Evil. Retrieved November 27, 2010. ^ Mills, Elinor (April 30, 2007). "Google's culture czar". ZDNet. http://www.zdnet.com.au/meet-google-s-culture-czar-339275147.htm. Retrieved November 27, 2010. ^ Kawamoto, Dawn (July 27, 2005). "Google hit with job discrimination lawsuit". CNET News. http://news.cnet.com/Google-hit-with-job-discrimination-lawsuit/2100-1030_3-5807158.html?tag=nl. Retrieved November 27, 2010. ^ "Google accused of ageism in reinstated lawsuit". CTV News. Associated Press (CTV Television Network). October 6, 2007. http://www.ctv.ca/servlet/ArticleNews/story/CTVNews/20071006/google_old_071006/20071006. Retrieved November 27, 2010. ^ Hancock, Jay (October 31, 2007). "Google shares hit $700". The Baltimore Sun. http://weblogs.baltimoresun.com/business/hancock/blog/2007/10/google_shares_hit_700.html. Retrieved November 27, 2010. ^ a b La Monica, Paul R. (May 25, 2005). "Bowling for Google". CNN. http://money.cnn.com/2005/05/25/technology/techinvestor/lamonica/index.htm. Retrieved February 28, 2007. ^ Fried, Ian (October 4, 2002). "A building blessed with tech success". CNET News (CNET). http://news.cnet.com/2100-1040-960790.html. Retrieved February 15, 2010. ^ Stross, Randall (September 2008). "Introduction". Planet Google: One Company's Audacious Plan to Organize Everything We Know. New York: Free Press. pp. 3–4. ISBN 978-1-4165-4691-7. http://books.google.com/books?id=xOk3EIUW9VgC&printsec=frontcover. Retrieved February 14, 2010. ^ Sullivan, Danny (July 1, 1998). "GoTo Going Strong". SearchEngineWatch.com (Incisive Interactive Marketing). http://searchenginewatch.com/2166331. Retrieved February 18, 2010. ^ Pelline, Jeff (February 19, 1998). "Pay-for-placement gets another shot". CNET News (CNET). http://news.cnet.com/Pay-for-placement-gets-another-shot/2100-1023_3-208309.html. Retrieved February 18, 2010. ^ Olsen, Stephanie (August 9, 2004). "Google, Yahoo bury the legal hatchet". CNET News (CNET). http://news.cnet.com/Google,-Yahoo-bury-the-legal-hatchet/2100-1024_3-5302421.html. Retrieved February 18, 2010. ^ Olsen, Stephanie (July 11, 2003). "Google's movin' on up". CNET News (CNET). http://news.cnet.com/Googles-movin-on-up/2110-1032_3-1025111.html. Retrieved February 15, 2010. ^ "Google to buy headquarters building from Silicon Graphics". Silicon Valley / San Jose Business Journal (San Jose: American City Business Journals). June 16, 2006. http://sanjose.bizjournals.com/sanjose/stories/2006/06/19/newscolumn3.html. Retrieved February 15, 2010. ^ Krantz, Michael (October 25, 2006). "Do You "Google"?". Google, Inc.. http://googleblog.blogspot.com/2006/10/do-you-google.html. Retrieved February 17, 2010. ^ Bylund, Anders (July 5, 2006). "To Google or Not to Google". MSNBC. Archived from the original on July 7, 2006. http://web.archive.org/web/20060707062623/http://msnbc.msn.com/id/13720643/. Retrieved February 17, 2010. ^ Google, Inc. (October 27, 2004). "Google Acquires Keyhole Corp". Press release. http://www.google.com/press/pressrel/keyhole.html. Retrieved November 27, 2010. ^ La Monica, Paul R. (October 9, 2006). "Google to buy YouTube for $1.65 billion". CNN Money. http://money.cnn.com/2006/10/09/technology/googleyoutube_deal/index.htm?cnn=yes. Retrieved February 26, 2010. ^ Story, Louise; Helft, Miguel (April 17, 2007). "Google Buys DoubleClick for $3.1 Billion". The New York Times (New York: The New York Times Company). http://www.nytimes.com/2007/04/14/technology/14DoubleClick.html?_r=1&ref=technology. Retrieved February 26, 2010. ^ Chan, Wesley (July 2, 2007). "All aboard". Official Google Blog. Google, Inc.. http://googleblog.blogspot.com/2007/07/all-aboard.html. Retrieved February 26, 2010. ^ "Google to Acquire On2 Technologies". Google Press release. August 5, 2009. http://www.google.com/intl/en/press/pressrel/ir_20090805.html. Retrieved July 5, 2010. ^ "Google Acquires Aardvark". Official Google Blog. Google. http://googleblog.blogspot.com/2010/02/google-acquires-aardvark.html. Retrieved February 12, 2010. "we're excited to announce that we've acquired Aardvark, a unique technology company." ^ Letzing, John (April 21, 2010). "Google buys stealthy start-up Agnilux". MarketWatch. http://www.marketwatch.com/story/google-buys-stealthy-start-up-agnilux-2010-04-21. Retrieved November 27, 2010. ^ Mills, Elinor (September 29, 2005). "Can Google beat the new-office curse?". CNET News. CBS Interactive. http://news.cnet.com/Can-Google-beat-the-new-office-curse/2100-1030_3-5884957.html. Retrieved February 26, 2010. ^ Kessler, Michelle; Acohido, Byron (October 3, 2005). "Google, Sun make 'big deal' together". USA Today (Gannett Co. Inc.). http://www.usatoday.com/tech/news/2005-10-03-google-sun-team_x.htm. Retrieved February 26, 2010. ^ Mills, Elinor (December 28, 2005). "What the Google-AOL deal means for users". CNET News. CBS Interactive. http://news.cnet.com/What-the-Google-AOL-deal-means-for-users/2100-1024_3-6010327.html. Retrieved February 26, 2010. ^ Lunden, Ingrid (February 12, 2010). "DotMobi Sells .Mobi Domain-Name Operator". Yahoo!. http://finance.yahoo.com/news/DotMobi-Sells-Mobi-DomainName-paidcontent-2969792871.html?x=0&.v=1. Retrieved February 26, 2010. ^ "Google AdSense for Mobile unlocks the potential of the mobile advertising market". Google, Inc.. September 17, 2007. http://www.google.com/intl/en/press/annc/20070917_mobileads.html. Retrieved February 26, 2010. ^ "Fox Interactive Media Enters into Landmark Agreement with Google Inc.; Multi-Year Pact Calls for Google to Provide Search and Advertising across Fox Interactive Media's Growing Online Network Including the MySpace Community". B Net (CBS Interactive). August 7, 2006. http://findarticles.com/p/articles/mi_m0EIN/is_2006_August_7/ai_n16610613/. Retrieved February 26, 2010. ^ Reuters (November 14, 2006). "Google closes $A2b YouTube deal". The Age (Melbourne). http://www.theage.com.au/news/Busness/Google-closes-A2b-YouTube-deal/2006/11/14/1163266548827.html. Retrieved July 5, 2010. ^ Yen, Yi-Wyn (March 25, 2008). "YouTube Looks For the Money Clip". http://techland.blogs.fortune.cnn.com/2008/03/25/youtube-looks-for-the-money-clip. Retrieved July 5, 2010. ^ Hardy, Quentin; Evan Hessel (May 22, 2008). "GooTube". Forbes Magazine. http://www.forbes.com/forbes/2008/0616/050.html. Retrieved July 5, 2010. ^ "Tracking Santa: NORAD & Google Team Up For Christmas, Dec 1, 2007, Danny Sullivan" (in en). Search Engine Land. http://searchengineland.com/tracking-santa-norad-google-team-up-for-christmas-12817. Retrieved July 5, 2010. ^ "Behind the scenes: NORAD's Santa tracker for Thur, Dec 21, 2009 By Daniel Terdiman, CNET" (in en). CNET. http://news.cnet.com/8301-13772_3-10418101-52.html. Retrieved December 31, 2009. ^ "Instructions On Tracking Santa With NORAD & Google: The 2007 Edition, Dec 24, 2007, Danny Sullivan" (in en). Search Engine Land. http://searchengineland.com/instructions-on-tracking-santa-with-norad-google-the-2007-edition-13001. Retrieved July 5, 2010. ^ Shalal-Esa, Andrea (September 6, 2008). "GeoEye launches high-resolution satellite". Washington: Reuters. http://www.reuters.com/article/2008/09/06/us-geoeye-idUSN0633403420080906. Retrieved February 26, 2010. ^ "Google gives online life to Life mag's photos". Associated Press. Mountain View, California. November 20, 2008. http://www.msnbc.msn.com/id/27802744/. Retrieved February 25, 2010. "Google Inc. has opened an online photo gallery that will include millions of images from Life magazine's archives that have never been seen by the public before." ^ Greg Stirling (November 18, 2008). "Google Hosting Time-Life Photo Archive, 10 Million Unpublished Images Now Live". Search Engine Land. http://searchengineland.com/google-to-host-10-million-time-life-unpublished-images-15513. Retrieved July 5, 2010. ^ Morrison, Scott; Sweet, Cassandra (May 4, 2010). "Google Invests in Two Wind Farms". Wall Street Journal. http://online.wsj.com/article/SB10001424052748704342604575222420304732394.html. Retrieved November 27, 2010. ^ Gomes, Lee (May 18, 2010). "Google's Latest Telephony Play". Forbes (Forbes, Inc.). http://www.forbes.com/2010/05/18/google-microsoft-videoconferencing-technology-telephony.html. Retrieved November 27, 2010. ^ Albanesius, Chloe (May 27, 2010). "Google Closes Acquisition of AdMob". AppScout. Ziff Davis Publishing Holdings Inc.. http://www.appscout.com/2010/05/google_closes_acquisition_of_a.php. Retrieved June 16, 2010. ^ Albanesius, Chloe (November 9, 2010). "Google Acquires Mobile Display Ad Firm AdMob". PC Magazine. Ziff Davis Publishing Holdings Inc.. http://www.pcmag.com/article2/0,2817,2355609,00.asp. Retrieved June 16, 2010. ^ "Google buys power from Iowa wind farm". News.techworld.com. July 21, 2010. http://news.techworld.com/green-it/3232690/google-buys-power-from-iowa-wind-farm/?olo=rss. Retrieved October 26, 2010. ^ Canada. "Bid for Nortel patents marks Google's new push into mobile world". The Globe and Mail. http://www.theglobeandmail.com/report-on-business/google-bids-900-million-for-nortel-patents/article1969788/. Retrieved 2011-04-25. ^ "Form 10-K — Annual Report". EDGAR. SEC. http://www.sec.gov/Archives/edgar/data/1288776/000119312507044494/d10k.htm. Retrieved July 5, 2010. ^ Nakashima, Ellen (August 12, 2008). "Some Web Firms Say They Track Behavior Without Explicit Consent". The Washington Post (The Washington Post Company). http://www.washingtonpost.com/wp-dyn/content/article/2008/08/11/AR2008081102270_pf.html. Retrieved July 5, 2010. ^ Helft, Miguel (March 11, 2009). "Google to Offer Ads Based on Interests". The New York Times. http://www.nytimes.com/2009/03/11/technology/internet/11google.html. Retrieved July 5, 2010. ^ Bright, Peter (August 27, 2008). "Surfing on the sly with IE8's new "InPrivate" Internet". Ars Technica. http://arstechnica.com/microsoft/news/2008/08/surfing-on-the-sly-ie8s-inprivate-internet.ars. Retrieved September 1, 2008. ^ "AdSense". https://www.google.com/adsense/login/en_US/?sourceid=aso&subid=uk-en-ha&utm_medium=ha&utm_term=adsense&gsessionid=O---pJlnnf2wFZF8qu81Lg. Retrieved October 11, 2009. ^ Stamoulis, Nick (March 24, 2008). "Why Companies Are Upset With Google's Search-Within-Search". Search Engine Optimization Journal. http://www.searchengineoptimizationjournal.com/2008/03/24/why-companies-are-upset-about-googles-search-within-search/. ^ "Google Somewhat Lifts Oceana Ad Ban". webpronews.com. http://www.webpronews.com/topnews/2004/05/17/google-somewhat-lifts-oceana-ad-ban. ^ "Google AdSenseTM Online Standard Terms and Conditions". Google AdSense. https://www.google.com/adsense/static/en_US/Terms.html. ^ Mclntyre, Douglas (October 31, 2008). "Yahoo and Google may dump their deal". Bloggingstocks.com. http://www.bloggingstocks.com/2008/10/31/yahoo-and-google-may-dump-their-deal/print/. Retrieved October 26, 2010. ^ Drummond, David (November 5, 2008). "Ending our agreement with Yahoo!". The Official Google Blog. Googleblog.blogspot.com. http://googleblog.blogspot.com/2008/11/ending-our-agreement-with-yahoo.html. Retrieved October 26, 2010. ^ "Google Demo Slam". Google, Inc.. http://www.demoslam.com/#/what. Retrieved November 18, 2010. ^ "Google Launches Demo Slam!". searchenginejournal. http://www.searchenginejournal.com/google-launches-demo-slam/25138/. Retrieved November 13, 2010. ^ Wiley, Jon (May 6, 2010). "The Google Design, turned up a notch". Official Google Blog. Google, Inc.. http://googleblog.blogspot.com/2010/05/google-design-turned-up-notch.html. Retrieved July 5, 2010. ^ "comScore Releases November 2009 U.S. Search Engine Rankings". December 16, 2006. http://www.comscore.com/Press_Events/Press_Releases/2009/12/comScore_Releases_November_2009_U.S._Search_Engine_Rankings. Retrieved July 5, 2010. ^ Michael Arrington (July 25, 2008). "Google's Misleading Blog Post: The Size Of The Web And The Size Of Their Index Are Very Different". Techcrunch.com. http://techcrunch.com/2008/07/25/googles-misleading-blog-post-on-the-size-of-the-web/. Retrieved December 31, 2010. ^ Olsen, Stefanie (July 9, 2003). "Google cache raises copyright concerns". CNET News. CBS Interactive. http://news.cnet.com/2100-1038_3-1024234.html. Retrieved June 13, 2010. ^ "Google Instant Censorship: The Strangest Terms Blacklisted By Google". The Huffington Post. http://www.huffingtonpost.com/2010/09/29/google-instant-censorship_n_743203.html. Retrieved October 26, 2010. ^ Farhad Manjoo (August 30, 2002). "Conspiracy Researcher Says Google's No Good". AlterNet. http://www.alternet.org/rights/14001/. Retrieved December 12, 2009. ^ Dave Gussow (April 14, 2003). "Despite popularly, Google under fire for privacy issues". St. Petersburg Times. http://www.sptimes.com/2003/04/14/Technology/Despite_popularly__Go.shtml. Retrieved October 11, 2008. ^ Tyler, Nathan. "Google to Launch Video Marketplace." Google. January 6, 2006. Retrieved February 23, 2007. ^ Cohen, Michael (January 14, 2009). "Official Google Video Blog: Turning Down Uploads at Google Video". Googlevideo.blogspot.com. http://googlevideo.blogspot.com/2009/01/turning-down-uploads-at-google-video.html. Retrieved January 2, 2010. ^ Martin, China (November 26, 2007). "Google hit with second lawsuit over Library project". InfoWorld. http://www.infoworld.com/t/platforms/google-hit-second-lawsuit-over-library-project-722. ^ Pettersson, Edvard (November 20, 2009). "Google Wins Preliminary Approval of Online Books Settlement". Bloomberg. http://www.bloomberg.com/apps/news?pid=newsarchive&sid=ahUxORgasDFs. Retrieved December 18, 2009. ^ Smith, Heather (December 18, 2009). "Google’s French Book Scanning Project Halted by Court". Bloomberg. http://www.bloomberg.com/apps/news?pid=newsarchive&sid=apZ3UG9CPLo8. Retrieved December 18, 2009. ^ Rich, Motoko (May 31, 2009). "Preparing to Sell E-Books, Google Takes on Amazon". The New York Times. http://www.nytimes.com/2009/06/01/technology/internet/01google.html. Retrieved December 18, 2009. ^ Mayer, Marissa (July 25, 2010). "This Week in Search 7/25/10". Official Google Blog. Google, Inc.. http://googleblog.blogspot.com/2010/07/this-week-in-search-72510.html. Retrieved July 28, 2010. ^ "How Pander/Farmer may be finding spun and plagiarised content.". April 14, 2011. http://scott-herbert.com/blog/2011/04/14/how-panderfarmer-may-be-finding-spun-and-plagiarised-content/. Retrieved April 15, 2011. ^ a b Cashmore, Pete (April 1, 2010). "Six ways Gmail revolutionized e-mail". London, England: Turner Broadcasting System, Inc.. http://www.cnn.com/2010/TECH/04/01/cashmore.gmail/. Retrieved April 2, 2010. ^ Chitu, Ionut Alex. (February 7, 2007). "More People Can Sign up for a Gmail Account". Google Operating System Blog. http://googlesystem.blogspot.com/2007/02/anyone-can-signup-for-gmail-account.html. Retrieved April 3, 2010. ^ a b Glotzbach, Matthew (July 7, 2009). "Google Apps is out of beta (yes, really)". Official Google Blog. Google, Inc.. http://googleblog.blogspot.com/2009/07/google-apps-is-out-of-beta-yes-really.html. Retrieved April 2, 2010. ^ Zibreg, Christian (February 11, 2010). "Facebook strikes back at Google, integrates its chat with AOL Instant Messenger". Geek.com. Geek.com, LLC. para. 5. http://www.geek.com/articles/news/facebook-strikes-back-at-google-integrates-its-chat-with-aol-instant-messenger-20100211/. Retrieved April 2, 2010. "While Gmail’s 146 million monthly users are no match for Facebook’s 400+ million-strong user base, not all of them use built-in chat." ^ Lee, Elvin (November 10, 2009). "Twice the storage for a quarter of the price". Official Google Blog. Google, Inc.. http://googleblog.blogspot.com/2009/11/twice-storage-for-quarter-of-price.html. Retrieved April 3, 2010. ^ Marshall, Gary (April 1, 2010). "Happy sixth birthday, Google Mail!". TechRadar. Future Publishing Ltd.. http://www.techradar.com/news/internet/happy-sixth-birthday-google-mail--680998. Retrieved April 3, 2010. ^ Rasch, Mark (June 15, 2004). "Google Gmail: Spook Heaven". The Register. http://www.theregister.co.uk/2004/06/15/gmail_spook_heaven/. Retrieved October 26, 2010. ^ Mazzon, Jen (March 9, 2006). "Writely so". Official Google Blog. Google, Inc.. http://googleblog.blogspot.com/2006/03/writely-so.html. Retrieved April 3, 2010. ^ Google, Inc. (June 6, 2006). "Google Announces limited test on Google Labs: Google Spreadsheets". Press release. http://www.google.com/intl/en/press/annc/spreadsheets.html. Retrieved April 4, 2010. ^ Arrington, Michael (October 10, 2006). "Google "Docs & Spreadsheets" Launches". TechCrunch. http://techcrunch.com/2006/10/10/google-docs-spreadsheets-launches/. Retrieved April 4, 2010. ^ Hoffman, Harrison (September 17, 2007). "Google Presentations gets the green light". CNET News. CBS Interactive, Inc.. http://news.cnet.com/8301-13515_3-9780287-26.html. Retrieved April 4, 2010. ^ Sterling, Greg (June 3, 2008). "Google Rebrands Custom Search “Business Edition” As “Google Site Search”". Search Engine Land. Third Door Media. http://searchengineland.com/google-rebrands-custom-search-business-edition-as-google-site-search-14123. Retrieved June 16, 2010. ^ Girouard, Dave (September 13, 2007). "We've Officially Acquired Postini". The Official Google Blog. Google, Inc.. http://googleblog.blogspot.com/2007/09/weve-officially-acquired-postini.html. Retrieved June 16, 2010. ^ Google, Inc. (October 3, 2007). "Google Adds Postini's Security and Compliance Capabilities to Google Apps". Press release. http://www.google.com/intl/en/press/pressrel/apps_postini_20071003.html. Retrieved June 15, 2010. ^ "Postini". Google, Inc.. http://www.google.com/a/help/intl/en/security/index.html. Retrieved June 16, 2010. ^ Helft, Miguel (March 8, 2010). "Google’s Computing Power Refines Translation Tool". The New York Times: para. 15. http://www.nytimes.com/2010/03/09/technology/09translate.html. Retrieved May 2, 2010. ^ Macht, Joshua (September 30, 2002). "Automatic for the People". Time Magazine (AOL Time Warner). http://www.time.com/time/business/article/0,8599,356152,00.html. ^ Travis, Hannibal (2008). "Opting Out of the Internet in the United States and the European Union: Copyright, Safe Harbors, and International Law". Notre Dame Law Review, vol. 55, p. 391 (President and Trustees of Notre Dame University in South Bend, IN). http://papers.ssrn.com/sol3/papers.cfm?abstract_id=1221642. Retrieved June 4, 2010. ^ Travis, Hannibal (2008). "Opting Out of the Internet in the United States and the European Union: Copyright, Safe Harbors, and International Law". Notre Dame Law Review, vol. 55, pp. 391-92 (President and Trustees of Notre Dame University in South Bend, IN). http://papers.ssrn.com/sol3/papers.cfm?abstract_id=1221642. Retrieved June 4, 2010. ^ Travis, Hannibal (2006). "Wi-Fi Everywhere: Universal Broadband Access as Antitrust and Telecommunications Policy". American University Law Review, vol. 55, p. 1701 (President and Trustees of American University in Washington, DC). http://papers.ssrn.com/sol3/papers.cfm?abstract_id=903425. Retrieved June 4, 2010. ^ "Google WiFi for Mountain View". Google, Inc.. http://wifi.google.com/. Retrieved June 16, 2010. ^ Smith, David (December 17, 2006). "The future for Orange could soon be Google in your pocket". The Guardian (London: Guardian News and Media Ltd.). http://www.guardian.co.uk/technology/2006/dec/17/news.mobilephones. Retrieved June 16, 2010. ^ Orlowski, Andrew (March 16, 2007). "Google Phone — it's for real". The Register. The Register. http://www.theregister.co.uk/2007/03/16/google_phone_confirmed/. Retrieved June 16, 2010. ^ Ricker, Thomas (January 18, 2007). "The Google Switch: an iPhone killer". Engadget. Weblogs, Inc.. http://www.engadget.com/2007/01/18/the-google-switch-an-iphone-killer/. Retrieved June 16, 2010. ^ "Licenses". Android Open Source Project. Google, Inc.. http://source.android.com/source/licenses.html. Retrieved April 4, 2010. ^ Lee, Nicole (September 23, 2008). "T-Mobile G1 details, price, and launch date revealed". CNET News. CBS Interactive, Inc.. http://news.cnet.com/t-mobile-g1-details-price-and-launch-date-revealed/. Retrieved April 4, 2010. ^ Siegler, MG (January 5, 2010). "The Droid You're Looking For: Live from the Nexus One Event". TechCrunch. http://techcrunch.com/2010/01/05/nexus-one-event/. Retrieved April 4, 2010. ^ Pichai, Sundar (September 1, 2008). "A fresh take on the browser". Official Google Blog. Google, Inc.. http://googleblog.blogspot.com/2008/09/fresh-take-on-browser.html. Retrieved June 16, 2010. ^ Pichai, Sundar (July 7, 2009). "Introducing the Google Chrome OS". Official Google Blog. Google, Inc.. http://googleblog.blogspot.com/2009/07/introducing-google-chrome-os.html. Retrieved June 16, 2010. ^ Alex, Pham; Hirsch, Jerry (July 9, 2009). "Google sees window of opportunity to launch operating system". Los Angeles Times. http://articles.latimes.com/2009/jul/09/business/fi-google9. ^ Levering, Robert; Moskowitz, Milton (January 22, 2007). Serwer, Andrew. ed. "In good company". Fortune Magazine (Cable News Network) 155 (1). http://money.cnn.com/magazines/fortune/fortune_archive/2007/01/22/8398125/index.htm. Retrieved June 19, 2010. ^ Levering, Robert; Moskowitz, Milton (February 4, 2008). Serwer, Andrew. ed. "The 2008 list". Fortune Magazine (Cable News Network) 157 (2). http://money.cnn.com/magazines/fortune/bestcompanies/2008/full_list/index.html. Retrieved June 19, 2010. ^ Levering, Robert; Moskowitz, Milton (February 2, 2009). Serwer, Andrew. ed. "The 2009 list". Fortune Magazine (Cable News Network) 159 (2). http://money.cnn.com/magazines/fortune/bestcompanies/2009/full_list/index.html. Retrieved June 19, 2010. ^ Levering, Robert; Moskowitz, Milton (February 8, 2010). Serwer, Andrew. ed. "The 2010 list". Fortune Magazine (Cable News Network) 161 (2). http://money.cnn.com/magazines/fortune/bestcompanies/2010/full_list/. Retrieved June 19, 2010. ^ "The World’s Most Attractive Employers 2010". Universum Global. Sept 28, 2010. http://www.universumglobal.com/IDEAL-Employer-Rankings/Global-Top-50. Retrieved October 28, 2010. ^ "Our Philosophy". Corporate Information. Google, Inc.. http://www.google.com/corporate/tenthings.html. Retrieved June 20, 2010. ^ "Noogler chez Google" (in (French)). http://www.zorgloob.com/2004/09/23/noogler-chez-google/. ^ Shinal, John (August 22, 2004). "Google IPO achieved its major goal: It's all about raising cash for the company and rewarding employees, early investors". San Francisco Chronicle (Hearst Communications, Inc.): p. J-1. http://www.sfgate.com/cgi-bin/article.cgi?f=/c/a/2004/08/22/BUGCL8BS201.DTL. Retrieved June 20, 2010. ^ La Monica, Paul R. (March 31, 2006). "Google leaders stick with $1 salary". Cable News Network. http://money.cnn.com/2006/03/31/technology/google/index.htm. Retrieved June 20, 2010. ^ "Another Googler goes to Facebook: Sheryl Sandburg becomes new COO". Venture Beat. March 4, 2008. http://venturebeat.com/2008/03/04/facebook-hires-sheryl-sandberg-to-be-its-new-coo/. Retrieved March 31, 2008. ^ Moritz, Scott (March 4, 2008). "Top Google exec jumps to Facebook". Fortune. http://money.cnn.com/2008/03/04/news/newsmakers/moritz_google_exec.fortune/. Retrieved March 31, 2008. ^ Liedtke, Michael (March 5, 2008). "Facebook Raids Google for Executive". Washington Post. http://www.washingtonpost.com/wp-dyn/content/article/2008/03/04/AR2008030402766.html. Retrieved March 31, 2008. ^ "Netshops Inc. Appoints Ash ElDifrawi as Company's First Chief Marketing Officer". PR Newswire. March 26, 2008. http://www.prnewswire.com/. Retrieved March 31, 2008. ^ "Google Announces Fourth Quarter and Fiscal Year 2010 Results and Management Changes". Investor.google.com. http://investor.google.com/earnings/2010/Q4_google_earnings.html. Retrieved 2011-04-25. ^ Mediratta, Bharat (October 21, 2007). "he Google Way: Give Engineers Room". The New York Times (The New York Times Company). http://www.nytimes.com/2007/10/21/jobs/21pre.html. Retrieved June 20, 2010. ^ Mayer, Marissa (speaker). (June 30, 2006). Marissa Mayer at Stanford University. [Seminar]. Martin Lafrance. Event occurs at 11:33. http://www.youtube.com/watch?v=soYKFWqVVzg. Retrieved June 20, 2010. "Fifty percent of what Google launched in the second half of 2005 actually got built out of 20% time." ^ "Google ranks number one on list of ideal employers". New York Post. Mar 22, 2011. http://www.nypost.com/p/news/national/google_ranks_number_one_on_list_tF2RURTMzb5pYs2OGBzWJM?CMP=OTC-rss&FEEDNAME=. ^ a b c Reardon, Marguerite. "Google takes a bigger bite of Big Apple." c net. October 2, 2006. Retrieved October 9, 2006. ^ "Google Completes Pittsburgh Office, Holds Open House". WTAE ThePittsburghChannel. November 17, 2006. http://www.thepittsburghchannel.com/technology/10346550/detail.html. Retrieved January 13, 2008. ^ Olson, Thomas (December 8, 2010). "Google search: Tech-minded workers". Trib Total Media. http://www.pittsburghlive.com/x/pittsburghtrib/business/s_712700.html. Retrieved December 8, 2010. ^ "Inside Google's Michigan Office". InformationWeek. October 24, 2007. http://www.informationweek.com/news/internet/webdev/showArticle.jhtml?articleID=202600809. ^ a b Richmond, Riva. "Google plans to build huge solar energy system for headquarters." MarketWatch. October 17, 2006. Retrieved October 17, 2006. ^ "Official Google Blog: Mowing with goats". Google. May 1, 2009. http://googleblog.blogspot.com/2009/05/mowing-with-goats.html. ^ Siegler, MG (May 3, 2009). "My Day With The Google Goats". The Washington Post. http://www.washingtonpost.com/wp-dyn/content/article/2009/05/04/AR2009050400027.html. Retrieved May 3, 2010. ^ "Sheep Mow Lawns". National Semiconductor. http://www.national.com/rap/Horrible/sheep.html. Retrieved July 5, 2010. ^ Strand, Ginger. "Keyword: Evil." Retrieved April 9, 2008. ^ "Google MentalPlex". Google, Inc.. April 1, 2000. http://www.google.com/mentalplex/. Retrieved July 5, 2010. ^ "Welcome to Google TiSP". Google, Inc.. April 1, 2007. http://www.google.com/tisp/. Retrieved July 5, 2010. ^ "Google Paper". Google, Inc.. April 1, 2000. http://mail.google.com/mail/help/paper/more.html. Retrieved July 4, 2010. ^ "Gmail Custom Time: Google makes custom time". Google (Google). April 14, 2011. http://mail.google.com/mail/help/customtime/index.html. Retrieved April 14 2011. ^ Schmidt, Eric (April 1, 2010). "A different kind of company name". Official Google Blog. Google, Inc.. http://googleblog.blogspot.com/2010/04/different-kind-of-company-name.html. Retrieved July 4, 2010. ^ "April Fools: Google Changes Name to Topeka". CBS News (CBS Interactive, Inc.). April 1, 2010. http://www.cbsnews.com/stories/2010/04/01/business/main6353136.shtml. Retrieved July 4, 2010. ^ "Google's GMail Motion launched April 1". GMA News (GMA News). April 1, 2011. http://www.gmanews.tv/story/216708/technology/googles-gmail-motion-launched-april-1. ^ "Language Tools". Google, Inc.. http://www.google.com/language_tools. Retrieved July 4, 2010. ^ "Google Search Results for 'answer to life the universe and everything'". Google, Inc.. http://www.google.com/search?q=answer+to+life+the+universe+and+everything. Retrieved July 4, 2010. ^ "Google Search Results for 'recursion'". Google, Inc.. http://www.google.com/search?q=recursion. Retrieved July 4, 2010. ^ "anagram search". Google, Inc.. http://www.google.com/search?q=anagram. Retrieved Sep 22, 2010. ^ "About the Foundation". Google, Inc.. http://www.google.org/about.html. Retrieved July 16, 2010. ^ Hafner, Katie (September 14, 2006). "Philanthropy Google’s Way: Not the Usual". The New York Times. http://www.nytimes.com/2006/09/14/technology/14google.html. Retrieved July 16, 2010. ^ Helft, Miguel (February 23, 2009). "Philanthropy Google’s Way: Not the Usual". The New York Times. http://www.nytimes.com/2009/02/24/technology/companies/24google.html. Retrieved July 16, 2010. ^ "Project 10 to the 100th". Google, Inc.. http://www.project10tothe100.com/. Retrieved July 16, 2010. ^ Van Burskirk, Elliot (June 28, 2010). "Google Struggles to Give Away $10 million". Wired.com. http://www.wired.com/epicenter/2010/06/google-struggles-to-give-away-10-million/. Retrieved September 26, 2010. ^ Twohill, Lorraine (September 24, 2010). "$10 million for Project 10^100 winners". Google, Inc.. http://googleblog.blogspot.com/2010/09/10-million-for-project-10100-winners.html. Retrieved September 26, 2010. ^ "Google donating 1 million euros to IMO". January 20, 2011. https://www.imo2011.nl/node/39. Retrieved February 4, 2011. ^ Richard Whitt (October 22, 2009). "Time to let the process unfold". Google Public Policy Blog. http://googlepublicpolicy.blogspot.com/search/label/Net%20Neutrality. Retrieved December 20, 2009. ^ Cerf, Vinton (February 7, 2006). "The Testimony of Mr. Vinton Cerf, Vice President and Chief Internet Evangelist, Google" (PDF). p. 8. http://judiciary.senate.gov/hearings/testimony.cfm?id=1937&wit_id=5416. Retrieved May 4, 2008. ^ Cade, Metz (December 7, 2009). "Google chief: Only miscreants worry about net privacy". The Register. http://www.theregister.co.uk/2009/12/07/schmidt_on_privacy/. Retrieved January 5, 2010. ^ "Privacy International 2007 Consulation Report" (PDF). http://www.privacyinternational.org/issues/internet/interimrankings.pdf. Retrieved October 26, 2010. ^ "No anonymity on future web says Google CEO". THINQ.co.uk. August 5, 2010. http://www.thinq.co.uk/2010/8/5/no-anonymity-future-web-says-google-ceo/. Retrieved August 7, 2010. ^ Sherman, Chris (2005). Google power: unleash the full potential of Google. Emeryville, California: McGraw-Hill. p. 415. ISBN 0072257873. http://books.google.com/?id=SRadJIuhVjAC&dq=Google+Power;+Unleash+the+Full+Potential+of+Google&q=Daniel+Brandt#v=snippet&q=Daniel%20Brandt. Retrieved June 13, 2010. "...a look at Google's monopoly, algorithms, and privacy issues." ^ Varghese, Sam (January 12, 2005). "Google critic releases source code for proxy". The Age (Melbourne). http://www.theage.com.au/news/Breaking/Google-critic-releases-source-code-for-proxy/2005/01/12/1105423537735.html. Retrieved October 11, 2008. ^ Agger, Michael (October 10, 2007). "Google's Evil Eye: Does the Big G know too much about us?". Slate. http://www.slate.com/id/2175651/. Retrieved October 23, 2007. ^ Graham, Jefferson (February 9, 2010). "Google adds Facebook-like features to Gmail". USA Today. http://content.usatoday.com/communities/technologylive/post/2010/02/google-buzz--facebook-in-gmail/1. Retrieved April 30, 2010. ^ "Google censors itself for China". BBC. January 25, 2006. http://news.bbc.co.uk/2/hi/technology/4645596.stm. Retrieved January 31, 2008. ^ Scott Shane and Andrew W. Lehren (November 28, 2010). "Leaked Cables Offer Raw Look at U.S. Diplomacy". The New York Times. http://www.nytimes.com/2010/11/29/world/29cables.html?_r=1. Retrieved December 26, 2010. "...China’s Politburo directed the intrusion into Google’s computer systems in that country, a Chinese contact told the American Embassy in Beijing in January, one cable reported. The Google hacking was part of a coordinated campaign of computer sabotage carried out by government operatives, private security experts and Internet outlaws recruited by the Chinese government. ..."
^ Bill de Blasio, Office of the Public Advocate for the City of New York (August 5, 2010). "Google: Disclose Now!". http://advocate.nyc.gov/google. Retrieved August 11, 2010. ^ Michael Liedtke, AP Technology Writer (May 14, 2010). "Google grabs personal info off of Wi-Fi networks". Finance.yahoo.com. http://finance.yahoo.com/news/Google-grabs-personal-info-apf-2162289993.html?x=0. Retrieved October 26, 2010. ^ Shiels, Maggie (May 15, 2010). "Google admits wi-fi data blunder". BBC News. http://news.bbc.co.uk/1/hi/technology/8684110.stm. v · d · eGoogle Inc.
Access Co., Ltd. · Ascender Corporation · Cooliris, Inc. · eBay · Google · LivingImage · Myriad · Motoya Co., Ltd. · Nuance Communications · NXP Software · Omron Corporation · PacketVideo · SkyPop · SONiVOX · SVOX · VisualOn Inc.
Activision Blizzard · Adobe · Akamai · Alexion Pharmaceuticals · Altera · Amazon.com · Amgen · Apollo Group · Apple · Applied Materials · Autodesk · ADP · Baidu · Bed Bath & Beyond · Biogen Idec · BMC Software · Broadcom · C.H. Robinson · CA · Celgene · Cephalon · Cerner · Check Point · Cisco · Citrix · Cognizant · Comcast · Costco · Ctrip · Dell · Dentsply · DirecTV · Dollar Tree · eBay · Electronic Arts · Expedia · Expeditors International · Express Scripts · F5 Networks · Fastenal · First Solar · Fiserv · Flextronics · FLIR Systems · Garmin · Gilead Sciences · Google · Henry Schein · Illumina · Infosys · Intel · Intuit · Intuitive Surgical · Joy Global · KLA Tencor · Lam Research · Liberty Media · Life Technologies · Linear Technology · Marvell · Mattel · Maxim Integrated Products · Microchip Technology · Micron Technology · Microsoft · Millicom · Mylan · NetApp · Netflix · News Corporation · NII · Nvidia · O'Reilly Automotive · Oracle · Paccar · Paychex · Priceline.com · Qiagen · Qualcomm · Research In Motion · Ross Stores · SanDisk · Seagate · Sears · Sigma-Aldrich · Staples · Starbucks · Stericycle · Symantec · Teva Pharmaceutical · Urban Outfitters · Verisign · Vertex Pharmaceuticals · Virgin Media · Vodafone · Warner Chilcott · Whole Foods Market · Wynn Resorts · Xilinx · Yahoo! This page was last modified on 2 May 2011 at 18:21.